Whether it’s your special anniversary week or the big day to pop the question, all you need is an exotic location and ambience to do it right. This eco resort featuring superior sky villa in Nashik is the place to be. 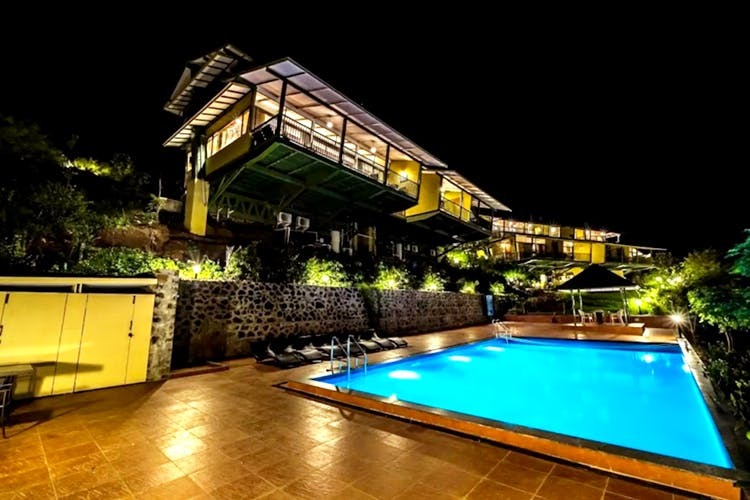 The resort is located at Anjaneri in Nashik, which is about five-and-a-half hour drive away from Pune. Take NH60 via Pandharpur Road and Shivaji Nagar Wakdewadi Road. For more details, click here. It’s the look and the feel of this resort that just does it for you. The villas are built on an elevated land, on a bridge-like structure, by the side of a cliff. The eco-resort, thus, overlooks a panaromic view of the mountains, a quiant little waterbody and the pristine lush green spread. Every villa has breathtakingly beautiful terrace with well-maintained potted flowers, climbers, manicured shrubs and more. The villas have one master bedroom which accommodates two guests. Rustic with minimalist tones of beige, wood and soft cream, the rooms are equipped with cupboards, dressing area, lounge chairs, a table, television, WiFi, coffee maker and rain shower bath cubicles. This place is a total winner, and we highly recommend you to book it ASAP. For more details, click here. Make this weekend special with the bae at Eco Resort’s, Super Sky Villas.